In this article, we show you the current rules for using drones in China. In China, the flying of a drone is permitted. In large metropolises or near government buildings or in politically troubled areas, I would be particularly cautious and relinquish the one or the other aerial photograph. Maximum flight altitude: In China, you are not allowed to fly higher than 120 meters (= 400 feet). Maximum horizontal distance and FPV: Your drone can fly up to 500 meters away from you in China. Compulsory insurance: I recommend to complete a insurance for drone flights in China. Maximum take-off weight (MTOW): If you want to fly a drone with a take-off mass of more than 250 Gramm, you must register your UAV (online registration). As far as I know, drones may be operated up to a weight of 7 kilograms in China. An authorization from the CAAC is required for unauthorized flight systems with a higher take-off weight. Distance to airports: No data available at the moment. Other safe distances: No data available at the moment. Flight bans: Beijing is in a no-fly zone: within the 6th Ring Road, multicopters are not allowed to climb. Flight approval: No data available at the moment. Time of operations: No data available at the moment. Regulations for commercial pilots: For commercial copter operations, a permit from the CAAC is necessary. Good to know: Readers of our blog had the problem that a no-fly zone was set up along the Great Wall and their Copter could not take off. So do not be disappointed if a flight does not work as planned at well-known sights. 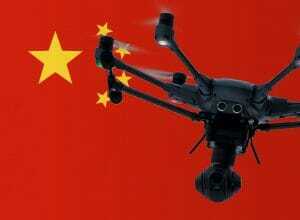 We have researched the listed drone regulations for China to the best of our knowledge. We can not guarantee the correctness of the information. If you want to be on the safe side, please contact the Chinese aviation authority. Alternatively, you can also ask the embassy in your country for further information about the regulations. Please leave us a comment when you receive news and/or gain experience with your copter in China! Hi Chinese one is not very accurate. Beijing is in a no-fly zone. You can fly a drone within the 6th ring road which is about 50 km from the city center. I mean you can NOT. Cool Victor, thanks for your comment. I will update/extend the article as soon as possible. hi, exactly. You can’t fly within the 6th ring. DJI will update the firmware of your drone when you will first turn it on. This update will add the list of nofly zones in China. On your phone screen, you will see the map and the following message: “No GPS signal”. Therefore your drone won’t be able to take off. You can still pay a trip to the wall and do great shots there, after CAAC registration. I do own a Mavic Air, and I do have the same issue. Bought it here, can’t fly it here. Hi, i actually have seen chinese people piloting one above the Xi Lake in Hangzhou. so my guess is that it is possible. What about Tibet? Any idea? You can’t fly it in Lhasa and anywhere near military facilities. i am in FengHuang, China now (Nov 1, 2017). DiSTANCE LIMIT of 50 meters. 50 meters! I am getting ready to purchase a drone for an upcoming trip to China. Any recommendations on beginner models? Are visitors required to register their drones with China? I think the DJI Mavic Air is a good drone for the beginning. And yes, you also need to register your drone in China. Mavic Air without any hesitation. The best drone so far to travel with. If you want an advice, purchase the bundle. You’ll get 3 batteries. It’s very frustrating to find the perfect spot, and run out of juice after few minutes. My son had a stopover in Shanghai. This was very difikult because he had to take his Suitcase from one to next plane , althow same china airline with all checkings. Most have only with chinese advices. 1 Battery from 2 he had to put in his handbag . You need at least 3 hours. Good to know, thank you Majew! For CAAC registration requires you to have a celllphone number in china before moving on. Do you need it or no? I will be heading there in a few days. You need it to fly legally. Hi ime going to base camp, can i fly there? I’m planning to take my drone to Tibet and Xinjiang in August. Initially, I will be arriving at Beijing International Airport then will be taking 3 internal flights within China. Do anyone know about rules in Tibet for drones? Given the recent political situation in Xinjiang – where as many as a million Uyghur people are in concentration camps, the whole place is a police state, and it is increasingly difficult for foreigners to visit – I’d be really surprised if they let you in there with a drone. Maybe only for really touristy places. Interesting ! Where are these camps? Can you give GPS coordinates? Thank you! don’t fly in the city. You should be OK.
How did your Tibet and Xinjiang plan pan out? I’ll be taking my spark in to Tibet this October. Did you register your drone with the CAAC? You need to register you drone in CAAC(http://uas.caac.gov.cn) before you fly it in china (if fly under 120metre height and in eye-view(500meter),you do not need a drone license, but you need to register the drone and paste the genertated QR Code on you drone. hi.. I am in shanghai on a visit and bought a drone for my kid. will I be permitted to carry this from shanghai to HK and from there to India? if so, cabin or check-in luggage? you must put the batteries in your cabin luggage if you board the flight in China.